Today I'm sharing another card made with the package of chipboard anchors I found in Target's Dollar Spot. The first card featured a navy blue anchor, the second featured a light pink one and this one showcases the light blue. I love the nautical look! I embellished with enamel dots, a piece of flair, twine, a button and a die cut all atop a pre-printed tag for a clean and simple look. Loving your card, Lisa, the anchor is so cute and the cool blues are fab! How adorable and fun. Love the blues too. Loveeeeeee this! LOVING the flair and the anchor!!!!!!!!!!!!!!!!!!!!!!! thanks for the inspiration...I have those anchors too! 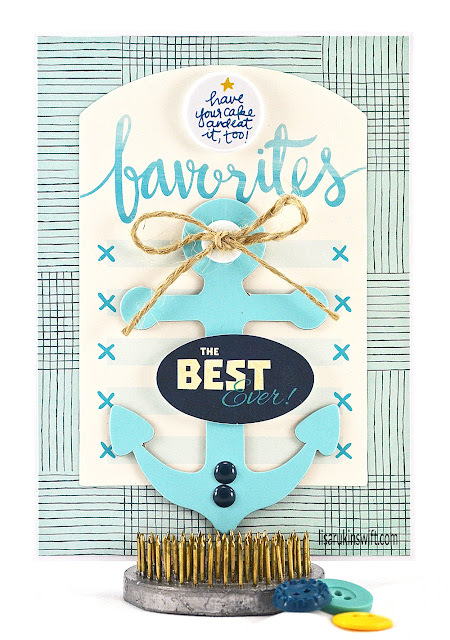 Love these anchor cards Lisa, they are all so wonderful!!! Beautiful card!! LOVE the blues!! The anchor, sentiment and flair are AMAZING!! WHOA, LISA - this card is seriously the BEST EVER!!! Love the soft blues and that anchor is awesome! !